Adventure Sardinia - 'Le Ragnatele' ~ Sardinia Baby! “Le Ragnatele' offers children and adults the opportunity to try out tree top adventure courses along high wire trails that you can find at different heights thanks to hanging platforms, steel cables, Tibetan bridges, cable ways on pulleys, ropes and rope-ladders. The Park offers 8 adventure courses of varying difficulty: Red, Green, Yellow and Green Plus for ADULTS; Orange, Blu, Red and Pink – children must be accompanied by an adult – for BABY courses. The tree top adventure courses are accessible to people of all ages. The access is ruled only by the height reached with raised arms: starting from 120 cm (usually 3-5 years old children) for Baby courses and from 145 cm for Adults ones. All the courses are accessibile to people with handicaps – the pink course is suitable for people with mobility problems - so as the other services of the Park: Toilets, Bar and Refreshments, Grill Area, Barbecuing Area&Picnic tables, Children's playground. 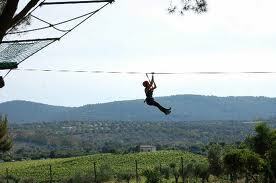 Le Ragnatele Adventure Park is the ideal place for holding Team Building sessions or company incentive programmes. The fresh outdoors, testing concentration, courage and coordination helps promote awareness of one's own abilities and strengthen team spirit. The Park has all the features useful for environmental respect. In February 2011 received RETRAPARC – trans-border net for parks certification. It is a brand born to benefit the promotion of products and services of the operators that own high level of social, environmental and economic quality in order to guarantee a high level of touristic offer to visitors. A certified authority checks operators' requirements. “Le Ragnatele" adopts a high level environmental policy: starting form lightning (using LED- low energy consumption), building material (all the structures are made in wood, there is not a trace of cement), food (only local fish, meat and wine), also detergents (only biological detergents). Even irrigation is 100% local, water comes from reclamation authority. We want to keep this policy trying to make even better year by year. The whole structure has an independent fire system that can be shared with the area around. A refreshment always available for any need with hot meals, drinks, snacks,sandwiches. Every year Le Ragnatele organizes for the summer season a series of events devoted to sport, music, singing and adventure. “Le Ragnatele' Adventure Park was opened in 2008 in one of the most enchanting areas of the Coral Coast. It lies within the Protected Marine Area of Isola Piana-Porto Conte and boarders the Porto Conte Natural Park. “Le Ragnatele' is a stone's throw from the famous "Le Bombarde" beach, and is just seven kilometres from the centre of Alghero, and Alghero-Fertilia airport. Since the beginning of the season (usually coinciding with the Easter holidays) until mid-June open only on weekends or in particular occasions /special holidays. From June until late September, open every day from 10AM to 11PM.